The United States is overwhelmingly responsible for global warming, and the Republican Party is overwhelmingly responsible for preventing the US from reducing its carbon emissions. Future generations will refer to the climatic chaos of a globally-warmed world as the " Republican Climate." The facts of global warming have been very well established. In a few cases, extremists present it as something so bad that it will make us all fall over dead. Of course, global warming will not happen this way. But it doesn’t have to. Because our entire world civilization is tied closely to the stability of the climate, even just a few degrees of global warming will cause social and economic collapse. Global warming won’t make us fall over dead, but it might cause civilization to enter a period of chaos and start wars. And the Republican Party has been the major force in the entire world for suppressing the science of global warming and even the smallest steps toward doing something to prevent it. The International Panel on Climate Change of the United Nations (IPCC) represents the best international scientific and governmental consensus understanding of the problem. The Fourth Assessment Report (in four parts) is available for free download at their site, plus information about their upcoming Fifth Assessment Report. It is a conservative document, representing a consensus rather than any one person’s possibly biased views. If anything, the IPCC has underestimated the problem; a paper published by the American Association for the Advancement of Science showed that the actual changes now occurring in, for example, sea level rise are right at the top of the range that IPCC had predicted. The principal cause of global warming is the accumulation of carbon dioxide gas in the atmosphere. All organisms produce carbon dioxide naturally. Many release it into the air. Plants remove carbon dioxide from the air in the process of making food from sunlight. But the main reason that carbon dioxide levels are increasing in the atmosphere is the burning of fossil fuels by humans, for the production of energy (e.g., power plants), transportation (e.g., cars) and industry. Carbon dioxide prevents heat from being radiated from the Earth into outer space; it acts somewhat like a sweater or a greenhouse roof in this regard. Since the beginning of the Industrial Revolution, carbon dioxide levels in the atmosphere have increased from 280 to 380 parts per million, which is about one-third. 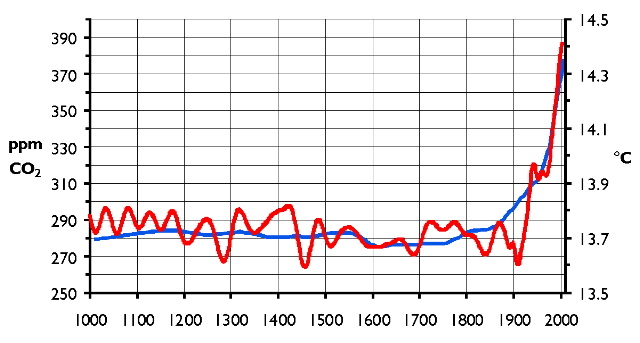 During that time, global temperatures have increased by about a degree C (over a degree F). A 100-ppm increase in carbon dioxide is enough to cause more than a one-degree increase in temperature, however. This means that the amount of carbon dioxide that has already accumulated has only now begun to cause global warming. A lot more global warming awaits us, as the Earth holds in more and more heat—even if we stopped emitting carbon dioxide right now, which is not possible. Global warming has occurred during the last century and a half. More information can be found here. This information comes from the Pew Center for Climate Change. Global temperatures are now as high as they have been at any time during the last half million years, but carbon dioxide levels are MUCH higher now than any time during the last half million years. Global warming has occurred in prehistoric times to an even greater extent than it is happening today. But that doesn’t matter. The end of the last Ice Age was a period of intense global warming. Plants, animals, and people could just migrate away from where it was too hot to new locations where the temperature was better suited to them. This option is not open to us today. Animals cannot simply migrate to new habitats with suitable temperature, because most of their habitats have been transformed into cities, farms, and roads. Ten thousand years ago, they just moved; today they are trapped. And so are humans. Global warming is already causing sea levels to rise, causing stronger storms, and causing changes in the climate of major agricultural areas. The people whose homes are buried by the sea or destroyed by storms, or who are hungry because their farmlands have experienced drought, cannot just move to new places, because there are already people living in those places, which are frequently on the other side of an international border. What are millions of environmental refugees from Bangladesh supposed to do—go to India? India doesn’t think so. For reasons such as this, United States intelligence agencies have identified global warming as a threat to global military security (http://media.npr.org/documents/2008/jun/warming_intelligence.pdf). Also, who is going to pay for the damage? Insurance companies, and the re-insurers who insure them. The largest insurance corporations suspect that they will not have enough money to pay for all the damage that global warming will cause. And all of this, without global warming actually killing anybody directly. It gets worse. Global warming feeds on itself. As global temperatures increase, soils and bogs get warmer, and their rate of decomposition increases. Soils and bogs then release carbon dioxide and methane into the atmosphere—methane is bubbling up from Siberian lakes right now. Therefore, people burning fossil fuels makes global warming worse, but global warming itself makes global warming worse—a cycle that feeds on itself. Global warming is caused principally by the overuse of fossil fuels. In response, many people have decided to cut back on the use of fossil fuels—by driving smaller cars, driving less, buying less, using their air conditioning less, etc. The biggest and most profitable corporations in the world are fossil fuel corporations, with Exxon Mobil leading the pack. They have an obvious interest in getting people to keep using as much fossil fuel as possible. They have funded (usually indirectly, through private think tanks) attempts to discredit the scientific data about global warming. There are extremely few scientists, and almost no published data, that discredit global warming science. “Denialism” of global warming is almost entirely the product of conservative politically-motivated websites. Some of the same people who tried to discredit the smoking-cancer link, while being paid by tobacco companies, are now denying global warming, while being paid by oil companies. The financial motivation of the fossil fuel industry is easy to see. Legal limits to carbon emission would cost them millions in profits. But global warming scientists and activists have no comparable financial motivation. I have written one of the books that contains global warming science, and I can tell you that the total amount of money I will receive from this book amounts to only a couple of hours’ worth of money taken home by the CEO of Exxon Mobil. I could earn a lot more money being a spokesperson for the denialists—which, with my credentials, would help them a lot. Even Al Gore, including his portion of the Nobel Prize (which he gave away), did not earn as much as a typical vice president of an oil company, and that was only for a couple of years (when he released his movie and received his prize). Fossil fuel companies have a virtual monopoly on their product. In contrast, alternative sources of energy are numerous and decentralized. No one can have a monopoly on sunlight or wind. There are indeed corporations waiting to profit from a decarbonized economy—lots of them, and none of them even a hundredth the size of Exxon Mobil. The denialists use reasoning that is obviously incorrect. They say, for example, that we have nothing to worry about, because plants will absorb the extra carbon dioxide from the air. Carbon dioxide will just make the Earth greener, they say. But this is not what is happening. Global warming (as well as continued human destruction of rainforests and other natural environments) is causing plants to absorb less, not more, carbon from the air. The principal source of power for the denialists, aside from oil company money, is the Republican Party. Nearly all Republican congressional representatives totally reject global warming science and any steps that could be taken to reduce carbon emissions. Such people as Oklahoma Senator Jim Inhofe are notorious all around the world for boastful ignorance about global warming science. It is entirely the fault of the Republican Party that a national response to the problem cannot be coordinated. One scientific suggestion has been to establish a cap and trade system, which would allow private corporations to figure out ways to reduce carbon emissions, rather than for the government to tell them how to do so. But the Republican Party has staunchly insisted that the federal government continue its support (including tax subsidies) of fossil fuel monopolies, rather than enabling hundreds of smaller corporations to begin solving the problem. The Republican Party has also ruined any possibility of international cooperation to reduce carbon emissions. Under Bush, it was even a joke. Bush left the 2008 meeting of leading economic powers while saying, “Goodbye from the world’s biggest polluter!” Very funny. Today, Senate Republicans block any possibility of carbon emission limits or international cooperation. Whoever publicly denies global warming and blocks action to prevent it is bringing suffering upon generations of the future—even the near future. The biggest offenders are Republican leaders of government and business. Their names are a matter of public record. It may be inevitable that future generations of global warming victims may look to the descendants of the global warming deniers, many of whom will have inherited a great amount of fossil fuel wealth, for financial compensation. The victims of the future may blame, and expect payment from, the heirs of the people who have caused the problem. Whether this is just or not, it may be inevitable. The people of the world will refer to the disastrous and chaotic temperatures, floods, and droughts that they experience as “The Republican Climate.” This is the future that the United States, and its Republican Party, is forcing upon the world.